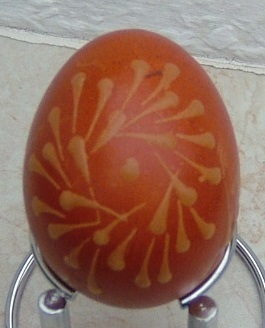 To create Easter eggs with intricate wax-resist designs as worked in the region surrounding Marburg in Hessia requires a lot of practice and an exacting attention to detail. 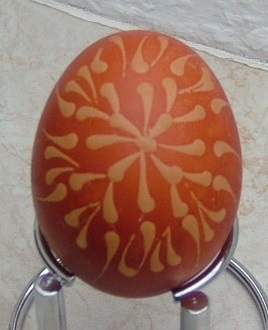 These elaborate Easter eggs are not meant to be eaten, instead they become precious keepsakes. Nevertheless we like to decorate our Easter eggs, which will be eaten after the hunt, using a traditional wax-resist method. Therefore pure beeswax is needed as well as a tool to apply the melted wax. 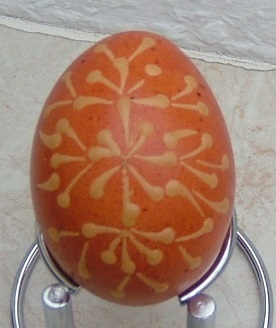 Well-known Ukrainian Easter eggs use a tool called a “kitska”. Also a “tjanting” could be used, but to handle these tools (kitska or tjanting) needs much more practice than the simple pin-tool. We improvise with equipment we have at hand. We simply use a pin with a largish head and stick it into any handle such as a wooden stick or something else. 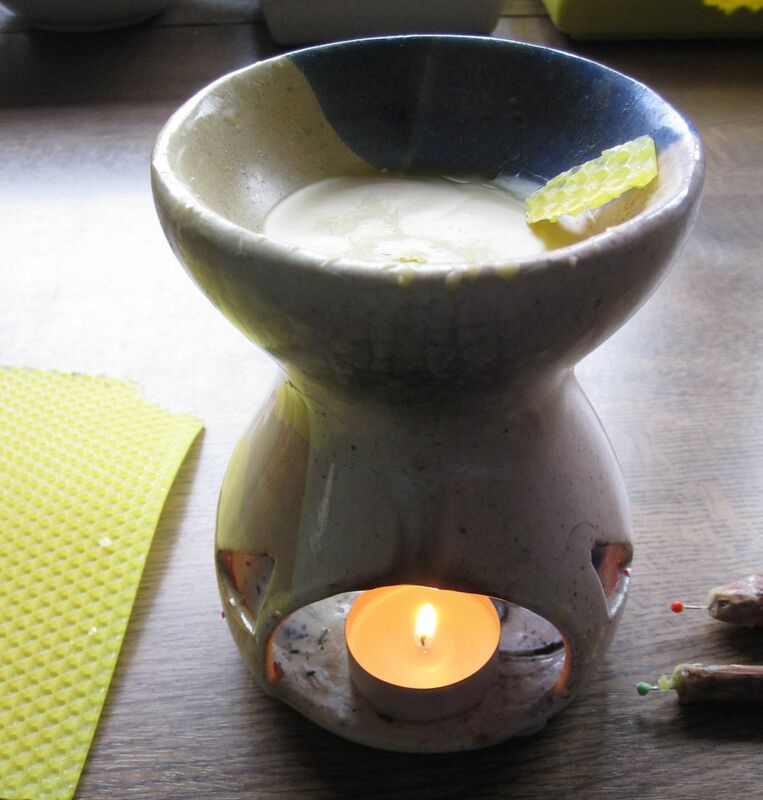 For melting the wax we use an old fragrance oil burner – a small tin can is also suitable. Because the eggs are for eating, they have to be boiled. Burst eggs are sorted out. 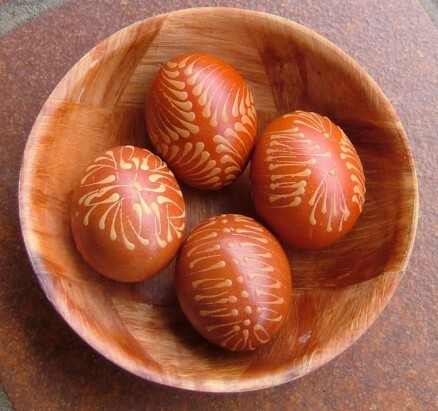 Patterns will be more pronounced on white eggshells, and more subdued on brown eggshells. The eggs should cool after boiling. A warm-to-the-touch condition is best for working with this material. 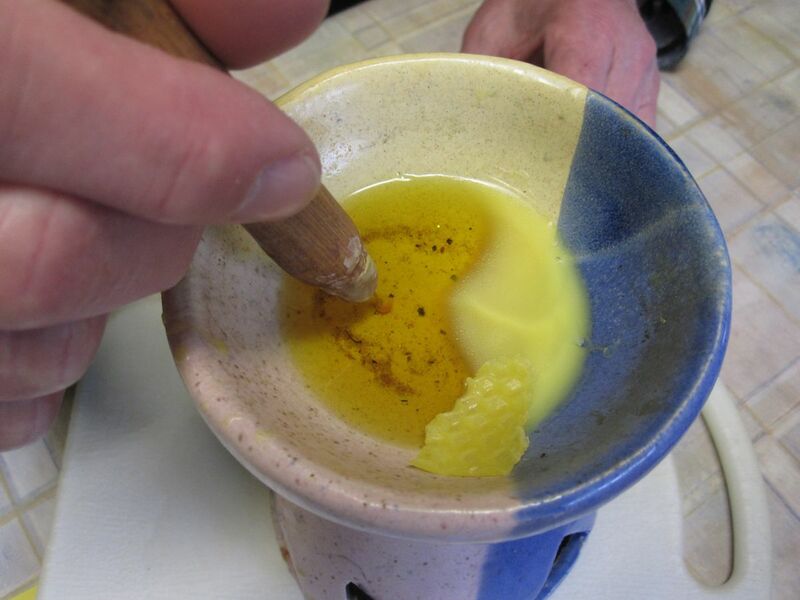 We melt the beeswax and dip the drawing tool into the melted wax. 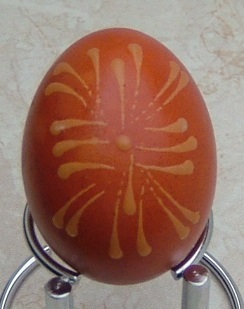 The egg is held in the left hand (for right-handed people). Working with quick movements, a dot or a drop-shaped line is drawn onto the egg. For every new dot or line, the drawing tool needs to be dipped into the wax again. The variety of patterns made by dots and drop-shaped lines only, is enormous. Here is a small selection. 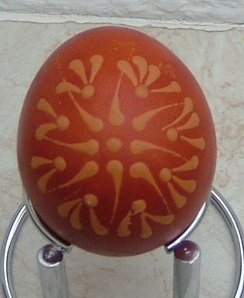 After decorating the egg, it is laid in a cold or up to moderate warm dye bath. A too warm dye bath allows the wax to melt. We like to use onion skins for dying. 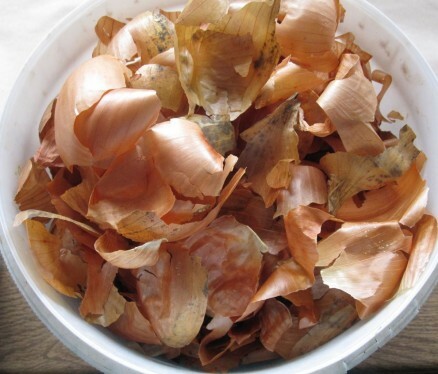 A large amount of onion skins are put in a pot and boiled until the dye bath becomes dark brown; it must cool before proceeding. 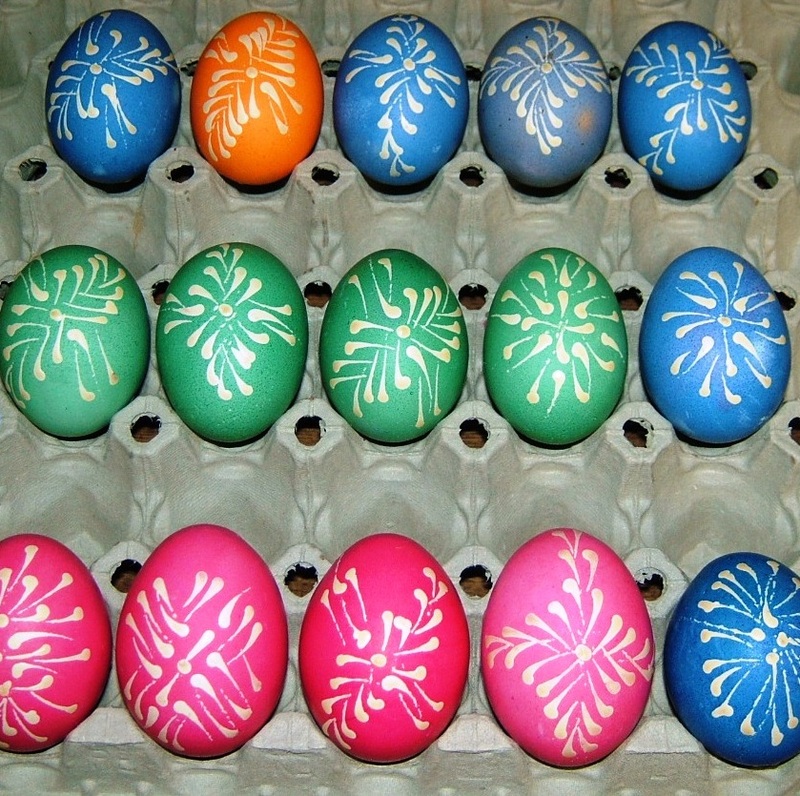 The decorated eggs are placed in the moderately warm or cold dye bath and remains there until the desired color intensity is achieved. 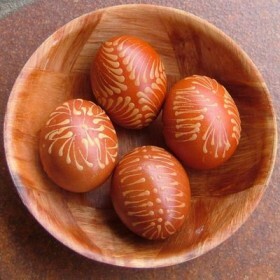 The dyed eggs are dried. 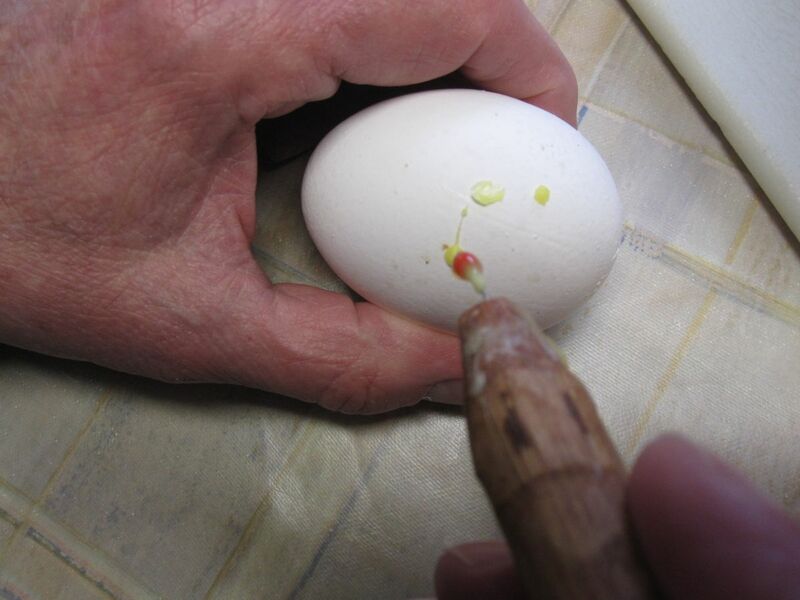 The wax can remain on the eggshell or it can be removed carefully by holding the egg over a candle flame until the wax glistens and then wiping the melted wax quickly with a paper towel. The egg is rubbed with bacon to bring it to shine. 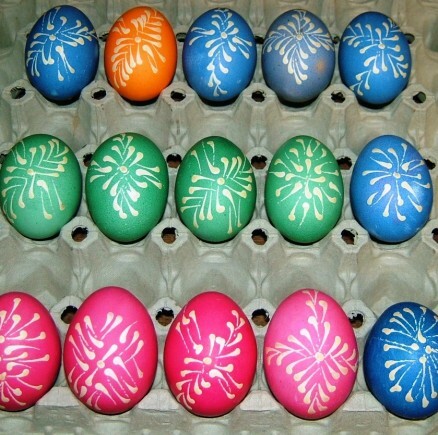 Have fun decorating and hunting for Easter eggs! 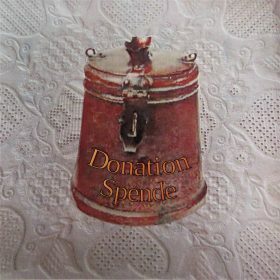 What a beautiful and creative idea !